A few weeks ago I mentioned to a friend I rarely see that I was letting my hair grow out. I text him a photo and called myself Storm, which is what my co-workers had been calling me. He replied, “No. You’re Rogue.” I started typing back “buzzkill” but decided to Google Rogue first. My edited response: “Rogue! 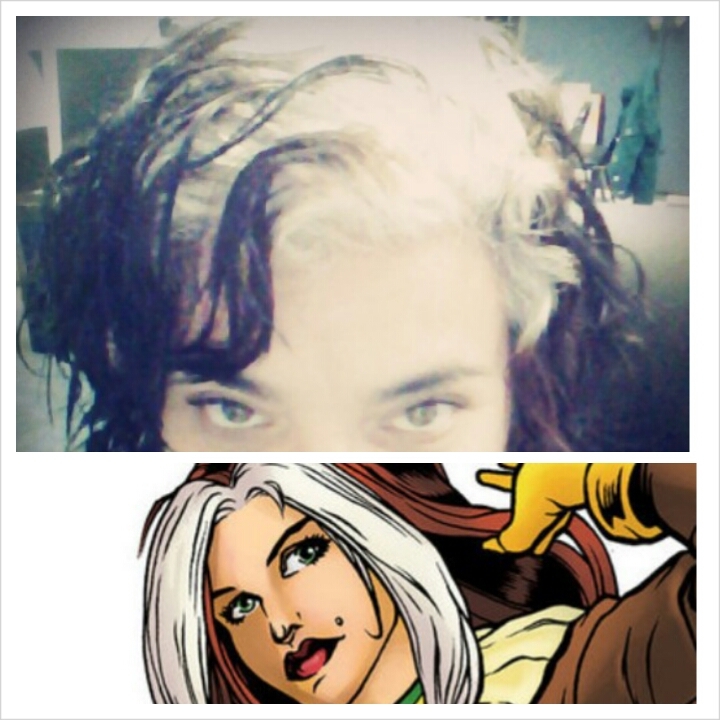 I can live with that.” Days later I chopped off my hair, and now, just shy of a month later, I’m really seeing the Rogue comparison and seeing just how close I am to looking like Storm. The looks from strangers, I’m never sure if they’re about the gray hair, but it’s a pretty safe bet. Just the other day, a boy about 12 sat next to me on the bus. I was in my own world, as per usual, and could hear what he was saying, but wasn’t really listening. It wasn’t until his Mom, who was sitting in front of him, said, “Shh, don’t say that. It’s not nice” that my mind recalled his comment, “Mom, she looks like the lady from 101 Dalmatians” and realized they were talking about me. “Oh my god! I was just compared to Cruella Deville,” I text my friend. She kindly reminded me that just a week earlier I had shared with her that a teenage girl had stopped me on the street just to tell me she loved my hair and that it was so cool. Validation from a teenager, who woulda thunk it? So that’s where I am at the moment. In a state of continuos pep talks, “I can get through this, I can make it. I’m rocking the gray naturally that young girls are trying to get from a bottle.” Sometimes it helps, sometimes it doesn’t, and I know that acceptance is a process. *Keep an eye out for my more in depth look at aging, graying, and the Latino standards of beauty coming soon to La Respuesta Magazine.